Most households, if not all, have a box of salt in the kitchen. Salt is considered an important seasoning, and because of the nutrients it contains and the many roles it plays in the human body, it is also considered a vital element of the human diet. There are numerous types of salts that are suitable for human consumption. We all know what regular table salt is, but we also see the term “kosher salt” in some recipes. What is the difference between the two? Kosher Salt is coarse-grained and is not very dense because of its large crystals. It is made by drying out seawater. Many food enthusiasts believe that it holds moisture better than regular table salt since it does not dissolve immediately because of its larger flakes. Iodine and anti-clumping elements like calcium silicate are rarely added to this type of salt. It is important to note that it is called “kosher salt” not because of its compliance with the Torah or Jewish Written Law. It is named kosher salt because its bigger flakes are ideal for “koshering,” which is the process of making meat kosher by removing surface blood through absorption. Best used in seasoning meat and vegetables before cooking, it can also be used to season food while cooking or even after cooking. Kosher salt may also be used in recipes that require the use of coarse salt. Table Salt is usually fine-grained and is made up of evenly shaped crystals. It is obtained by mining salt deposits found underground. Before it gets to the stores, it undergoes a process wherein trace elements are removed. Iodine and calcium silicate, to avoid clumping, are added as well. It’s commonly used for last-minute flavoring, such as in soups or water used to boil pasta. 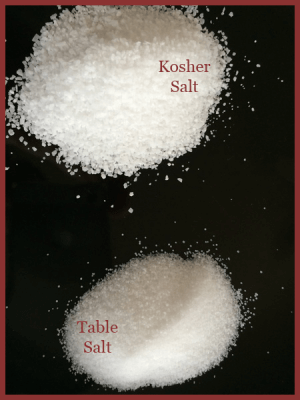 What, then, is the difference between kosher salt and regular table salt? Kosher salt is coarse and is collected from evaporated seawater. Regular table salt is finely grained and is from underground salt deposits. Kosher salt does not contain added iodine or anti-clumping elements, but regular table salt does. Both are edible and can be used for cooking, but kosher is best used for seasoning and flavoring before and during cooking, while regular table salt is most commonly used as a last minute seasoning.